In the Samarqand Oblast of Uzbekistan more and more women are involved in the criminal cases, related to transnational crime, for instance, drugs and human trafficking. These women do not only distribute drugs, but also produce them. The unsanctioned sowing and growing of drugs are the cases of women, mainly from rural areas. The women in Urgut district produce drugs in the farmland, hiding the seeds of cannabis between tomato and corn seeds. Despite the regular inspections, conducted by law enforcement bodies, the drugs production remains the business card of the Urgut district. 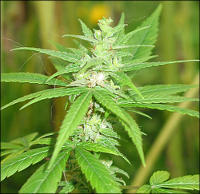 The local women are rarely put in jail: they all affirm that the cannabis seeds were accidentally brought by the wind. The female drug dealers also manage to avoid the punishment: producing guilty verdicts the judges usually go with conditional sentences and fees. For example, at one of the recent trials in the Payaryk district one female drug dealer was sentenced to four years of imprisonment and fine in the size of 101 thousand sum (about $65). However, four year sentence was replaced by one conditional year later on. The judges reason their decision by humanity of Uzbek legal system. Similar sentences are applied against women, involved in the human trafficking. For instance, in Samarqand women recruit people for work in the United Arab Emirates, promising the salary of at least $500. As a result, many girls are placed in the bordello as comfort girls. Some girls manage to escape and they go to police office. Ultimately, sentencing the criminals to 1-4 years of jail, the judges immediately change the verdict for conditional sentence. The judges motivate their decisions by the fact that often time female criminals do not have husbands and have underage children. Most of the women, conditionally sentenced for drugs or human trafficking, are alone and have 2-3 underage kids. However, almost guaranteed conditional sentence for such crime means that drugs and human trafficking is the best job for them, at least in Uzbekistan. The official data, published in the Zarafshon, the local oblast newspaper, says that in 2009 the courts of the Samarqand Oblast considered about 400 criminal cases against women. As a result, 141 women were conditionally sentenced for various terms, 93 were assigned correctional tasks. The rest of women were released on amnesty. Only 105 women were sentenced to imprisonment. It is also obvious that in the last months the crimes, related to drugs and human trafficking, take up significant share in the total number of crimes, committed by women.